Product Photography for On Line Sales | Tips! Product photography should be number one on your list if you are trying to sell your work on line. Because a buyer can’t pick up and look closely at your product, your pictures have to be good enough to convince them that they want it. If your photos are blurry or dark, if the background is too busy, if the colour is bad, people are not going to take the time to consider the purchase. Great photos will not only show how beautiful your product is, they will also capture the attention of your viewer and take them all the way to the check out. Be consistent. Find a background and lighting set up that you like and use it for every product. This will not only save you time but it will bring a cohesive look to your page. Background is everything. 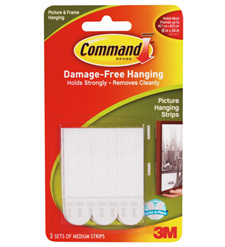 Don’t take a photo of your canvas resting on a chair or leaning against the wall. Take the time to hang it, light it and centre it in your photo. Choose a white or neutral background for your object. Keep it simple. Focus. Stay very still and let your camera focus properly. It only takes a second and makes all the difference. If you have one, use a tripod. Crisp, clean lines attract viewers. No flash. It will reflect off of your surface (especially paintings). Indirect lighting (illustrated below) is best. Any household lights will do! Natural lighting is best but not bright sunlight. If you have a light, don’t shine it right on your object. Instead, reflect it off a white wall or ceiling. Zoom in on it. Make the viewer feel like they can touch it. Even a photo with your cell phone can still be a great photo. Edit! There are a lot of free apps and programs that make it very simple to edit your photos. Visit www.passthefeather.org for a list of some of those great apps. AVIARY is great! You can crop, adjust saturation, re-colour, frame and add text, too. BE FUNKY is almost the same as Aviary but with a few less options. PHOTOSHOP EXPRESS EDITOR (at the bottom it says Photoshop Express Editor). Photoshop is the best for editing photos of people or zooming in on objects. Faults…can’t put a plain frame on a photo and a lot of the add-ons are tacky. FOTOR – This one is full of options! Lets you make cover photos and posts specifically designed for social media applications. It’s a little slow and quirky but it’s awesome for adding text (to make posts and memes) and great frames. Simple to use! When you upload your photos to Etsy, they have a built-in app that will help you edit. It’s not great, but it’s free. I still suggest that you use one of the above Apps first. The number one rule is never, ever, lean your painting on something to photograph it. This practice distorts the image and it is difficult to correct. Rule number two is never use a flash or shine a light directly onto your painting. All types of paint will reflect light. That will not only change your colours but it will cause shiny spots in your photo. 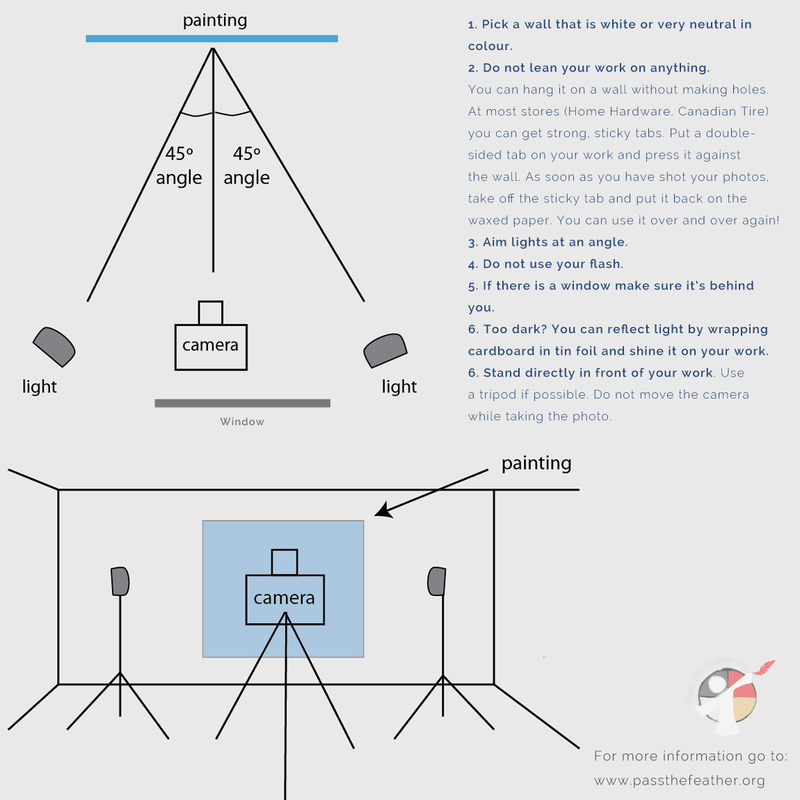 The diagram below will help you to take better pictures of your two dimensional art work. You can buy these at most hardware stores. But don’t leave them on too long. If you are going to use a model, be sure that you are zoomed in on the piece, not the model. Getting a close, clear, detailed picture is most important. If you must show the size of the product, use a model or an object that will put the image in perspective. Working with models is difficult. Often the viewer’s focus will be on the person, their skin, their hair and you don’t want that. You want the viewer’s eye to go directly to your jewelry. The best option is still a lightbox or softbox as they are often called. They are not expensive to buy or you can choose to make one from a cardboard box. Lights do not have to be professional! Any household light will do when you use a softbox. 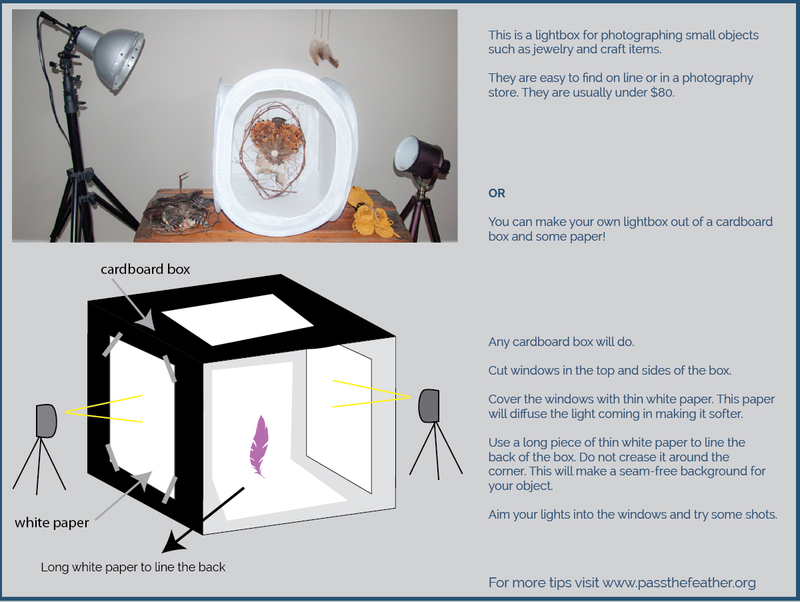 There is also a great tutorial on Etsy for a fancier lightbox. They have great suggestions! Click here to go to Etsy. When you’re trying to sell an item on line, the only thing that a customer bases the decision on is a photo. The ‘object’ of your photo is what you’re selling. So make it stand out and eliminate other distractions. 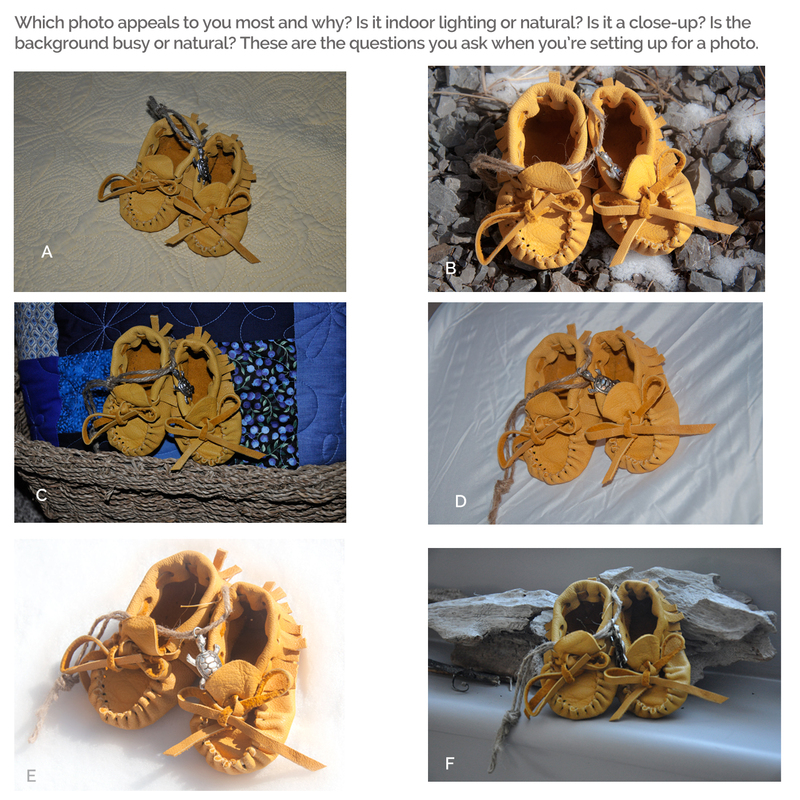 In the picture below, these baby moccasins are in six different settings. Which one would you use to sell on line? I’m torn between B, E and F. Why? 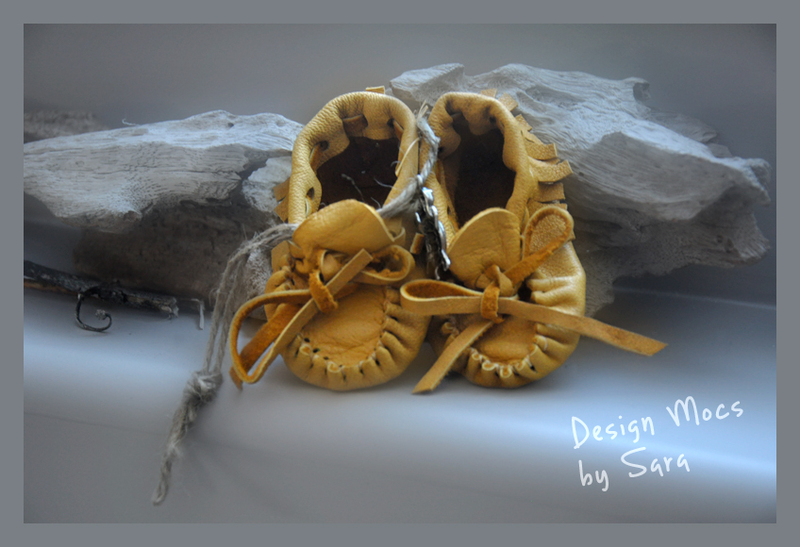 They are simple, and natural, like your baby moccasins. They are crisp close up photos and have simple backgrounds and natural sunlight. What if we were to edit photo ‘F’? All that we’ve done above is cropped, added a frame, blurred the image a little for ambience and added the artist’s name. This photo was taken underneath a window. No lights were used. Easy! It can never hurt to brighten your colours, adjust the sharpness and crop exactly to where you want it to be. Make sure what’s white IS white and what’s black IS black and everything else should fall into place. Even if you are using a cell phone to take the picture, you can edit it. You can visit our web page (www.passthefeather.org) to find links to free photo editing software and apps for phones and computers. These programs are very easy to use and will make all the difference in how you present your product to buyers. The next photos are a great example of simple cropping and colour enhancing (saturation). They also show you how to focus on a subject. When you look at the image on the right, your mind creates a story to go with the picture. 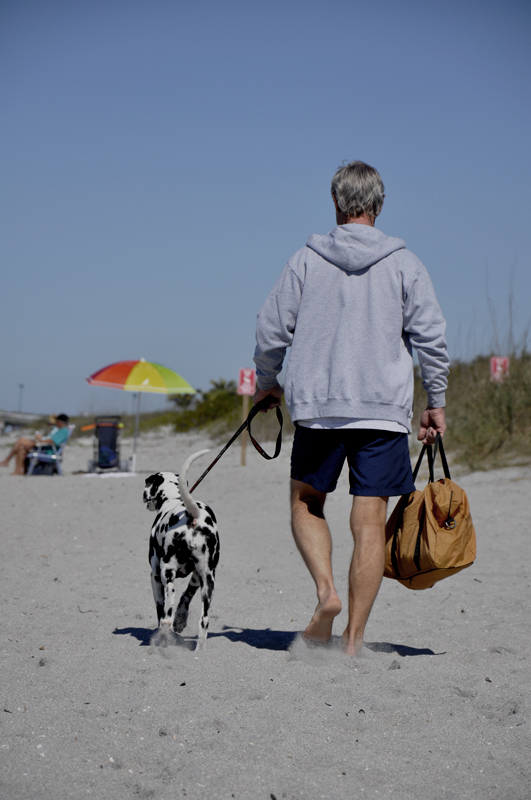 If you like dogs, it’s about walking the dog, if you like the beach, it will become about warmth, sun and sand. The bottom picture has been cropped and the colour enhanced. While it still may be about walking, the viewer is forced to zoom into the feet and the bag. This is how you demand that the object you are selling gets the attention it deserves. Even if you are using a cell phone to take the picture, you can edit it. For your phone, BE FUNKY is a simple to use, great little app! If you have access to Photoshop, even better but there are a lot of free apps on line that you can use to edit. For your computer, I came across PicMonkey. In the first photo, your eyes go right to the umbrella…or the area around it. In the second, you look down to their feet. This is important. Remember, when you’re selling an object, you want to focus on the object. This photo is a good demonstration of how to take the viewer’s eye to where you want it. Framing your photo can help, too. Framing your photo can really help to bring out the simplicity and colours and will create a finished look. 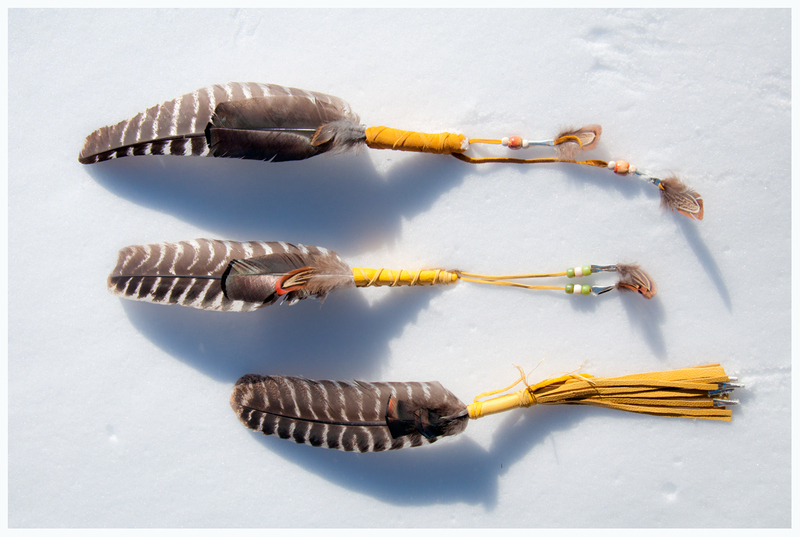 This is a quick photo I took of our sharing circle feathers. The white background in natural light will make whatever your photographing stand out. 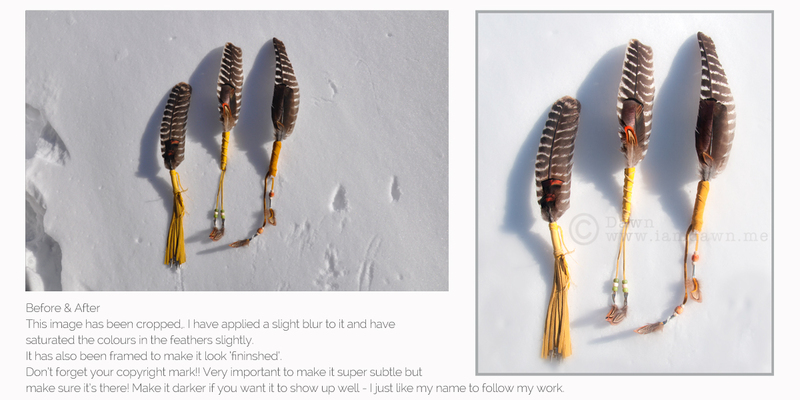 In this case I just laid the feathers in the snow. With a little editing (saturation, exposure, crop and frame) it is much better! It’s easy to make better photos and you won’t believe how it will improve your sales. If you have questions, or want us to help you edit photos, please email contact@passthefeather.org. We are happy to answer simple questions and we may even edit your photo for an art or cash donation to our Classroom Art & Knowledge Exchange Program! In this next post, we will show you how to size your photos perfectly for social media sales! Click HERE!